No. I won’t be voting today. Participating in the circus doesn’t make it any better for you and me. It only makes me another clown in the charade. “People who simply drop scraps of paper in a box or pull a lever are not acting like citizens,” Karl Hess wrote in his book Community Technology; “they are acting like consumers, picking between prepackaged political items. I also, just so you know, won’t be buying gold for a while. We’ve harped on and on about the Midas metal. And now we’re saying don’t buy it? No. We’re saying don’t buy it… yet. Because, according to our in-house “Antichrist,” gold is poised to sink much lower. The truth is, I have more constructive things to do than vote. For example, I just moved into a new apartment in the city, and the floors need a good scrub. And there’s a couch I have to take the legs off of so I can fit it into the living room. To me, that’s time much better spent. “There are a lot of reasons for us not to vote, but at the core it comes down to not wanting to enforce our will on others. I’m fine with making our voices heard, but when the vote has a direct impact on how much money is stolen from another family, I want nothing to do with it. “Both Democrats and Republicans support militarism, taxation, spying on us, inflation, redistribution of wealth, Keynesian economics and corporatism once they get in office. So today, I’ll be voting for the only one I can trust: nobody. Will you be voting? If not, what constructive thing will you do instead? “Is there a case to be made for voting?” Shaffer asked in 2000 on LewRockwell.com. “Indeed, there is, if one believes that social order is a quality that can be instilled, by violence and other coercive means, by political authorities. “I do not accept this proposition. “To the contrary, I believe that social order is the product of unseen, spontaneous influences of which most of us are not consciously aware. The study of economics helped me to understand how we respond, marginally, to fluctuations that are continuously generated by one another’s self-seeking pursuits. “I also came to understand that politics — like a rock thrown through a spider’s web — disrupts these informal processes as well as the existing patterns of interconnectedness upon which any social order depends. “I suspect that most of those reading these words share my sense of liberty and social order, and so I shall not address the mindset of the statists herein. “I understand the temptation, born largely of a sense of frustration, of wanting to participate in the political process in order to get persons elected who more closely reflect one’s views. The illusion of a short-term reduction in the rate of increase of state power clouds the longer-term consequences inherent in political participation. “Political systems derive their power not from guns and prisons, but from the willingness of those who are to be ruled to expend their energies on their behalf. For state power to exist, a significant number of men and women must sanction the idea of being ruled by others, a sanction that depends, ultimately, upon the credibility of those who exercise such power. “When we vote in an election, we are declaring, by our actions, our support for the process of some people ruling others by coercive means. “Our motivations for such participation — even if they be openly expressed as a desire to bring state power to an end — do not mitigate the fact that our energies are being employed on behalf of the destructive principle that liberty and social order can best be fostered through the coercive machinery of the state. “One of the sadder comments that I heard, just prior to the recent election, was from a radio talk show host whose thoughtful and analytical mind I generally respect. In response to a caller who complained that Gov. Bush was philosophically inconsistent upon some issue, he declared that ‘politics is the art of compromise,’ and that if one wanted principled consistency, one could find it ‘only in a religion.’ It is this attitude upon which I wish to focus, for I believe that the conflicts we experience — both within ourselves as individuals and socially — derive from a sense of division. “The attitude that one’s philosophic principles are nothing more than interesting ‘ideas’ that have no relevance to how we behave with others — an attitude that is implicit in this talk show host’s remarks — is what is destroying us, both individually and societally. It derives from the same sentiment, articulated in the actions of Bill Clinton, that truth-telling is simply one of a number of strategies available in efforts to reach political ‘compromise’; that a lie is as good as the truth if you can get others to believe it. It is the notion that principles are nothing more than fungible commodities — to be traded according to the prices dictated by prevailing fashion — that now directs the seemingly endless cycle of vote recounts in Florida. “If I am of the view that politics is destroying our world — and let us not forget that politics managed to kill off some 200,000,000 of our fellow humans in the 20th century alone — am I prepared to direct my energies into such a destructive system? “If I answer ‘yes,’ which I would do if I voted, then do my philosophic principles have any real-world meaning to them, or are they simply amusing ideas to be talked about, debated, or dispersed across cyberspace? “To participate in politics is to consciously devote one’s energies to mass-mindedness; to the statist proposition that collective thinking and collective behavior pre-empt the will of the individual. “Still,” Shaffer writes, “there is a basis for optimism. “Just as the marketplace generates its own responses to government regulatory schemes, there are informal processes at work undercutting the foundations of statism. “The collapse of the Soviet Union and the discrediting of state socialism generally; anti-taxation and secessionist movements throughout the world; the study of chaos — whose major tenet that complex systems are unpredictable strips away any rationale for state planning and control; the Internet as an unrestrained expression of information and ideas; and, in America, the contributions of Clinton and Gore to bringing discredit upon and destroying the credibility not only of the presidency, but of government itself, have all been major contributors to the terminal condition of Leviathan. “How remarkable, that the Internet — which Al Gore advised us he created! — should now be the undoing of the imperial presidency that he and Mr. Clinton sought to enlarge! What better confirmation of the power of unintended consequences! “At no period in my lifetime have the opportunities for reversing the dehumanizing nature of politically dominated societies been greater. Leviathan is dying as a consequence of its inner contradictions. All right. Gold. And why you shouldn’t buy. Our trading specialist, Greg Guenthner, aka the “Antichrist,” warned us yesterday that buying gold right now would be a terrible idea. At first, we felt a pang of skepticism. But then, our minds traveled back to February 2013. That was when Greg told readers that gold was headed down the tubes. Upon calling it, gold was $1,650. Many readers reacted harshly to his prediction. One even called Greg the “Antichrist.” Heh. Instead of seeing it as an opportunity to scoop up gold at a bigger discount, some saw it as an attack on what they stood for. And then, just like Greg said it would, gold plummeted. “Do not buy gold right now,” the Antichrist boomed from our trading desk. “Look, I’m going to let you in on a little secret here: Gold is a commodity that trades in cycles, just like any other asset. And the evidence tells me it’s heading down right now. If there’s one thing I want to drill into that head of yours, it’s that you can’t trade on your emotions. “You’ll go broke. Hey, I also love coffee. But if I think the price of coffee is heading down, I’m betting against it. Does that mean I hate coffee? Are you out of your gourd? “So if you’re a gold bug, don’t shoot, man. I’m just the messenger. “Here’s how gold’s bear market is unfolding,” Greg writes. “The first phase of gold’s death march began 18 months ago. It was pushing $1,600 in mid-April, and then WHAM — the bottom fell out. A vicious $200 drop knocked it down to about $1,385 an ounce in just two days. Longtime gold investors who’d enjoyed a decade of sunny skies were like, ‘Dude, what the @#$% just happened?’ Remember that? “I can’t make this any clearer: You shouldn’t even consider trying to buy gold right now. “You know the rest of the story. It’s been raining on the yellow stuff ever since. It now sits at $1,169. That’s about $450 off its April 2013 high. “And as I type, we’re seeing the same nasty weather forming in the charts as we saw 18 months ago. It feels like last April all over again. “YOU SHOULDN’T EVEN CONSIDER TRYING TO BUY GOLD RIGHT NOW!” Greg bellowed. “Just look at the similarity between the big 2013 nosedive and today’s downward action. In both cases, gold topped out with a series of lower highs before the crash accelerated. Last year, this action handed investors losses of more than 23%. “The main culprit in gold’s big flush right now? The continued strength of the U.S. dollar. Well, the relative strength of the dollar, I should say. Every other major currency has been worse. The buck is just the tallest midget in the circus. “Regardless, greenbacks soared last week after the Bank of Japan surprised everyone with its aggressive efforts to weaken the yen — think QE with rice and sushi. So the dollar has risen on the international market. “Gold is now breaking below $1,180. Bargain hunters stepped up multiple times when gold was below $1,200, both in 2013 and 2014. They thought it was a great buying opportunity. They were wrong. The big golden rebound they kept waiting for never came. They lost money — and now they know it. Investors tend to take things personally — and they won’t be fooled again. 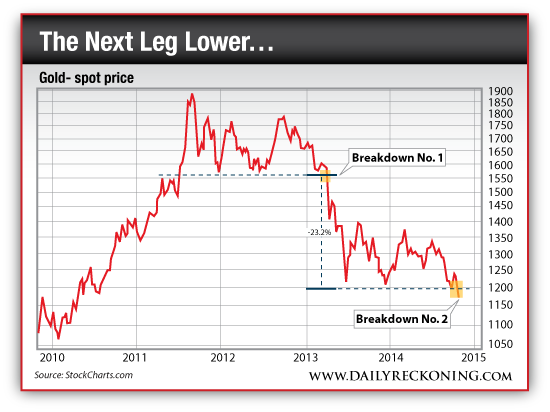 “Bottom line: Gold is now entering the second leg of its bear market. “No, it won’t take the elevator to zero. But investors will keep pushing the down button — gold has let them down once too often. As I told you 18 months ago, the great golden decade that saw prices leap from $300 to almost $2,000 is finished. Gold investors can prepare for more pain in the weeks and months ahead. “It gives me no joy to say it…but I expect gold to eventually come to rest somewhere near $1,000. Agree? Disagree? Let Chris know! Become a Laissez Faire Today member for FREE and be part of the conversation. Click here.